One thousand meals in under six hours. That was the work of a team of volunteers led by local Tech Startup, DataSeers. 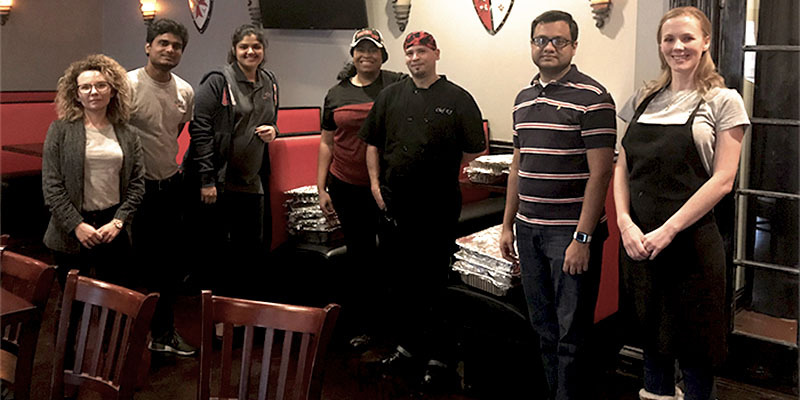 The meals were lovingly prepped, cooked, and delivered for dinner to those in need around the Metro Atlanta area… and just in time for the holiday season! The campaign, led by DataSeers’ CEO, Adwait Joshi, operated under the heartfelt belief that no one should be hungry this holiday season. The Alpharetta-based startup partnered with The Salvation Army and Second Helpings Atlanta to make a goal of “1000-fed” happen, and after six hours of hard work and good spirits, four charities (Red Shield Shelter, NFCC, Friendship Baptist Church, and Centro Misionero) received their freshly prepared meals to be distributed amongst the needy within their parishes. “The emptiness of the soul can be filled only by love, and we believe that giving is the best representation of love. It was a privilege to organize such an event. The feeling of helping others without expectation is amazing, and we hope to turn this into an annual tradition,” said Joshi. All the meals were carefully prepared at Fire & Brimstone Tavern by Chef RJ. He has contributed to several charities before, but “Feed the Hungry” is the first event for him as part of the Fire & Brimstone team. “It’s a pleasure to be able to help and cook for so many people who are hungry this season,” notes RJ. Led by compassion, a dozen volunteers (including DataSeers’ staff) contributed their time and positive energy to become part of this event. Each one of them put in their best efforts make the mission a reality. They helped with everything from packaging meals and delivering food, to even washing dishes. Joshi himself kicked off the campaign by sponsoring more than two hundred meals himself. Soon after, tens of companies and individuals followed suit to sponsor the remaining eight hundred. “I want to thank to each and every one of you who helped us. None of this would have been possible without your support,” added Joshi in appreciation for his team of volunteers.